Blasters of the Universe (PC/HTC Vive) Review - Game Reviews | Squackle.com! The Funniest Site on the Net! So we’ve got another VR game up to the plate. This one, Blasters of the Universe, by Secret Location, is something of a mashup. 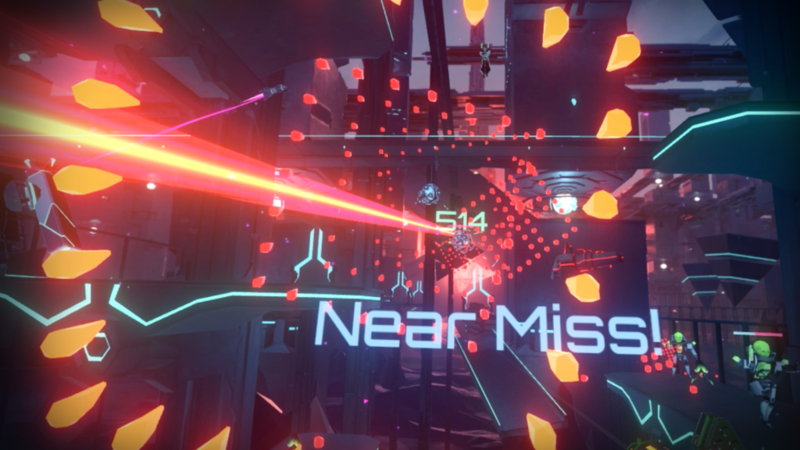 A vast majority of VR games belong to a genre collectively called “wave shooters,” which pit the VR player against wave after wave of enemies. Sometimes there are mechanics for moving around, but most of the time it’s standing or room-scale. Often the player is taking cover behind something, like a shield, and dodging what they can. Sometimes the enemies are zombies, sometimes they are robots, sometimes they are gangsters. Turns out: I do! And I don’t think my tastes are that refined, at least when it comes to VR. The premise is that some unemployed nerd named Allen was really good at arcade games in the 90’s, or maybe late 80’s. He was only good at games, somehow he was able to get into “VR” and has been living there ever since. Despite how very close the antagonist is to me in the game, the story’s not important. The Grand Master Virtual Space Lord Alwyn will be around to mock you, or even awkwardly praise you, but the meat of the game is blastin’ and dodgin’ with a lil’ bit of blockin’, and isn’t at all story driven. The same basic premise for the wave shooter: enemies will appear periodically while you shoot at them. However, their attacks come at you very slowly, often in patterns or huge fields of bullets. In many games, the player’s hitbox is some amalgam of their head, the area beneath, and possibly their hands. Blasters of the Universe does the unthinkable in most by making only the player’s head the hitbox. That allows for some pretty miraculous dodges, but it also allows the bullet hell mechanic to work without being absolutely frustrating. 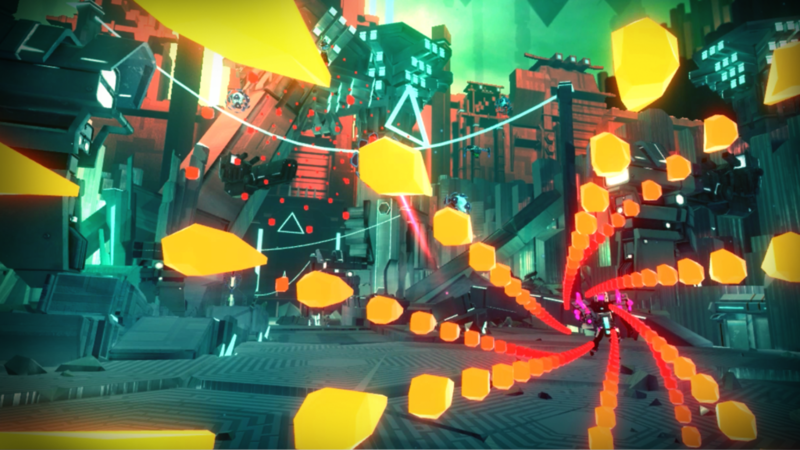 Your are limited by your own movements, which isn’t novel in VR, but it is for a bullet hell. There are a variety of enemies with their own patterns of attack that, when they are all firing at the player simultaneously, leads to some interesting gameplay. While the player tries to 3D limbo through all the space in between the bullets while trying to counter attack with their own gun. Less enemies means less things shooting, which means the player won’t have to somersault through death-fields. Occasionally there will be a boss that needs spanking, and they will have their own attacks, telegraphs and “puzzles” (if you can call the process of “how do I kill this?” a puzzle). There are four campaign levels with casual and “hell” modes, and each of those has an infinite mode if that’s your thing. What’s the shooting like, you ask? Well, that’s up to you. There are a bunch of weapon parts to fabricate your own gun out of. Semi-auto or full auto, magazines or recharging ammo pools, precision or spreadfire, you name it. Players pick a weapon frame, barrel, bullet type, magazine and a gadget to make their own weapon of choice. Along with this, they can pick different kinds of shields that, while unable to block everything that comes at the player, they can provide some relief in a pinch. They vary in size, strength and mechanics, with some changing the player’s defensive tactics entirely. The last thing of note is that each weapon frame has a special ability that charges as you shoot n’ dodge your way through waves. Specials like a super-powered laser that sustains for a few seconds, or having two guns for a short time. Blasters of the Universe performs pretty well on a 3770K processor and a GTX 980ti, and it took quite a lot going on to get any frame drops, which is somewhat admirable considering some of the garbage I’ve played, which is saying quite a bit. The art style might not be everyone’s scene, but it fits the narrative, and it gets the job done just fine. I like this game quite a bit. I don’t really dislike wave shooters, but there are a ton of them and most of them have their own “twist” that either doesn’t add anything novel, or complicates something that would otherwise be fun. Blasters of the Universe‘s take is one of the better, more unique spins, and in some ways improves on what “classic” (bare with me, the platform’s a baby) VR titles, like Space Pirate Trainer, laid out in the genre. It’s not what I’d call a relaxing game, but if you’re in the mood to move around and shoot at things, this is one of the better choices I’ve come across.